With it's flexible table structure and options to add new tables to existing ones, it's possible to build a database structure to keep all your clients in one relational database structure. Go deeper and also add campaign level and ads level to the data. And of course connect to Google Analytics to see what your campaigns do for revenue. Designing a database structure and it's relations will require the proper knowledge in your team to make it work. If you wish to save time: Cervinodata Gold (see pricing here) comes with the delivery of a relational table structure in Google BigQuery that get's you started right away. It's easy to feed dashboards, reports and BI tools using Google BigQuery. Due to it's native integration with leading data visualisation tools like Klipfolio, Google's own Data Studio, Sigma Computing, Tableau and others it's easy to use Google BigQuery as the central data source. If Google BigQuery is too advanced for your needs, Cervinodata also offers a simpler data feed function for Klipfolio and Google Data Studio, starting with Cervinodata Bronze, including data storage. It's possible to keep updating GoogleBig Query to have the most recent data available for reporting or interpretation. There are native connections to Google's own services (like Google Analytics, Adwords and Search Console) but adding other channels (like Adform, Facebook Ads, etc) will require you to either develop (and maintain) your own API connections. It also requires you to think about all the mapping of metrics and dimension when combining all the data. Cervinodata is a smart data collection and delivery service that keeps your Google BigQuery database up-to-date. 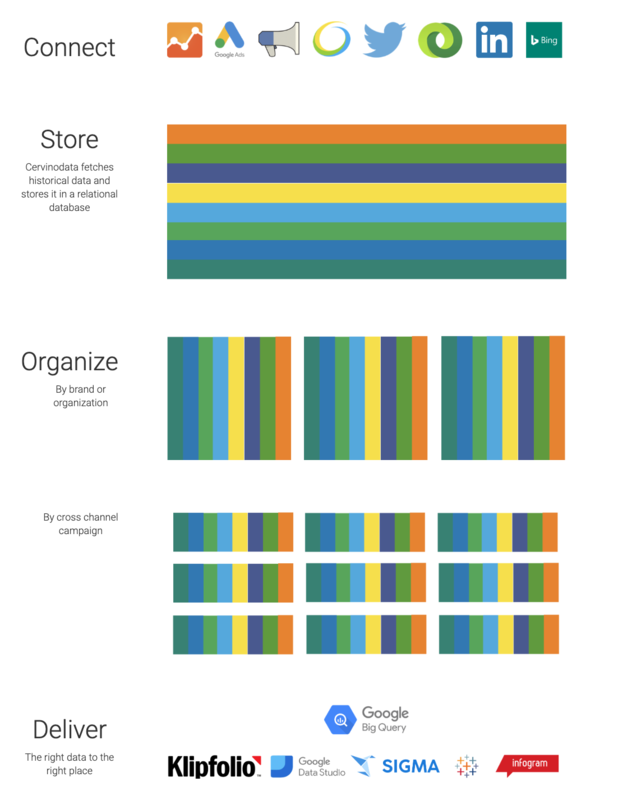 It collects the key metrics & dimensions from your online marketing channels and syncs it (up to) multiple times per day with Google BigQuery. With Google BigQuery as a starting point, it's relatively easy to dive deeper into the numbers. Google offers a whole range of data preparation and interpretation tools, as part of their Google Cloud Service. But even if you have the right skills in your team, finding relevant patterns and trends can be difficult. That's why Cervinodata is experimenting with adding intelligence to the data. We plan to develop additional and more advanced intelligence and automation services as we move forward.